Cucumber mosaic virus is a threat to food security. Last year this highly destructive disease was identified on a farm near Bundaberg, and now it has been found on a Charters Towers watermelon farm. As a student at Kew Gardens, this was a case study, and we were drilled about implementing ‘on site’ quarantine procedures to prevent disease entry into gardens and nurseries. What is Cucumber Green Mottle Mosaic Virus, and why is it so serious? Cucumber mosaic virus (aka Cucumber Green Mottle Mosaic virus, and CMMV) affects plants belonging to the cucumber family, the Cucurbitaceae, or more affectionately as ‘cucurbits’. Pumpkin, zucchini, cucumber, melon, squash and luffa, some of our favourite home grown cucurbits. This virus has a deservedly bad reputation because it affects more kinds of plant than any other virus. Until recently, it did not exist in Australia, but an outbreak in the Northern Territory has become out of control. Apart from affecting all cucurbits, it also affects plants from other, unrelated species, including banana, bean, beetroot, capsicum, carrot, celery, lettuce, spinach, tomato, Narcissus, including daffodil and jonquil, Desert Rose (Adenium obesum) and a wide range of annuals and weeds. Cucumber mosaic virus causes plants to turn pale and become stunted. A mosaic-like mottling and distortion of foliage, stems, flowers and fruit also develops. Check out this gallery. The virus is spread by sap-sucking pests, like aphid, as they move from plant to plant. Ants farm aphids, spreading them around gardens so they can milk them, only instead of milk, ants harvest sweet, sugary honeydew. Winged aphids are spread by wind and gales. Cyclones can be significant vectors of pests and diseases. Infected plants may be composted, the virus dies with its host. However, the virus remains active in perennial plants and also seed saved from infected plants. Control aphids. Spray aphids appropriately, using horticultural soaps (like Natrasoap), or pyrethrum, or a horticultural oil on annual and perennial flowers and vegetables. Use brands such as Pest Oil, DC Tron or Synertrol. Do not use white oil, this is for trees, shrubs, palms, bamboo and cycads. Buy seed of disease-resistant cultivars. Farmers sometimes grow these around the perimeter of fields with susceptible cultivars planted within them. Why? Aphids often move into crops from weeds like milk thistle (aka Sow thistle, Sonchus oleraceus). At first, they attack the periphery of fields. As they move through the resistant trap crop they become decontaminated, so (usually) by the time they reach susceptible crops they do not pose a risk. Never grow tomatoes next to cucurbits or other crops susceptible to this virus, they are definitely NOT companion plants. Never order seed on line from sources outside Australia. It is illegal, and multi-million dollar economic crops are put at risk. Mandatory testing of imported cucurbit seed occurs, and stiff penalties apply. Never mail seed from other parts of Australia to Western Australia or Tasmania, these states are protected by internal quarantine. Control weeds. I often get teased about having a tidy garden. But it’s not about keeping my garden looking nice, it’s about being organised. Chickweed (Stellaria media), groundsel (Senecio vulgaris) and purslane (Portulaca oleracea, a salad vegetable and weed of disturbed soil) are vectors of this virus. A dislike of these plants was rammed into us Kew students. Seed Savers conserve threatened food plants and contribute to national food security. It is our duty to save seed from our best plants only. Now we have an extra reason to be conservative. Port Curtis Organic Growers Seed Savers; Johnstone River Community Gardens Seed Savers; Seed Savers Up North, Southern Tablelands, Malanda; Kuranda Sprouts; Seed Savers Up North; Mt Molloy Seed Savers; and Cooktown Seed Savers. Diseases can be spread on gardening equipment, and pruning is an often overlooked method of disease spread. Cucumber mosaic virus is spread on pruning equipment. A standard method for disinfecting equipment is dipping pruning equipment in a 1% solution of household bleach and water; or dipping in teatree oil; or Clensel (hospital grade disinfectant) for thirty seconds. Back in 2003, while I was still managing the Royal Botanic Gardens, Sydney, I recorded a segment on horticultural hygiene for the ABC’s Gardening Australia programme. “No matter how small or how young your garden is, or whatever it is you are growing, horticultural hygiene will tip the balance in favour of healthy plants or crops. It can also make or break a successful garden”, I said. Peter Cundall liked it so much he rang me up. Read the Gardening Australia fact sheet here. So far, Cucumber mosaic virus has only been found in Charters Towers and Bundaberg. If you suspect Cucumber mosaic virus symptoms, this is a notifiable pest under the Australian Plant Protection Act, 1989. All suspected cases must be reported immediately. 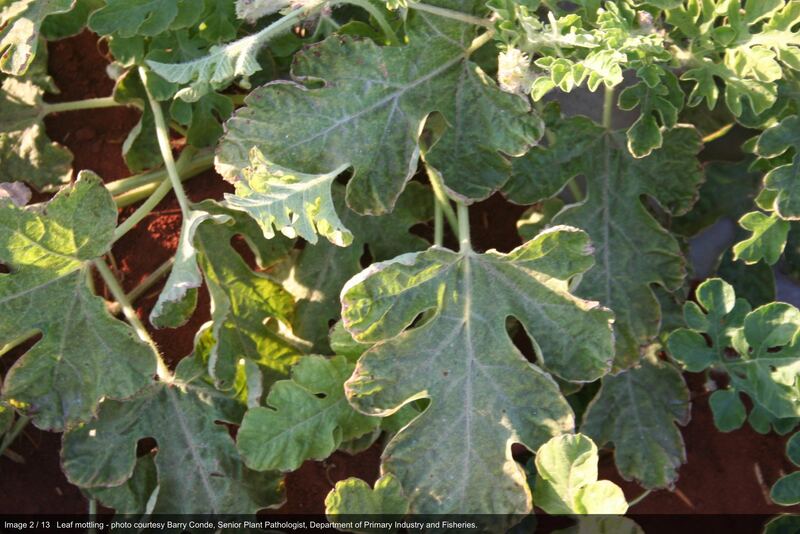 Be on the lookout for Cucumber green mottle mosaic virus and report it to Biosecurity Queensland on 13 25 23. Healthy gardens aren’t just a matter of luck or chance. Gardeners choose to help spread, or to limit the spread, of disease. So garden well, and sustainably. Heard this on the ABC this afternoon – very scary. They reported that the seeds were from the same company that supplied the ones to the NT. That’s an interesting bit of news, thanks Sam!